This year the Old Man seemed so frail. His eyes grew dim, his skin was pale. the scarlet cloth, threadbare and worn. His shoulders sagged as if the burden was too much. He seemed to shrink from any human touch. drowned out by the F16's triumphant roar. discarded toys crumbling beneath his feet. following the relentless phosphorous star? only a tear-stained note, or was it only dew? 'Oh children of Gaza, I came. 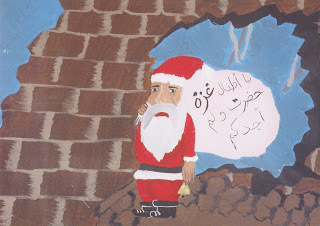 This poem was inspired by the Xmas card sent out by Medical Aid for Palestinians. The image was painted by Fatima, in the Bourj al Barajneh refugee camp in Lebanon, whose own life must be hard enough without thinking of her brothers and sisters in Gaza. The translation of the Arabic reads, "Oh children of Gaza, I came and didn't find you." There's a hole in my Firewall!